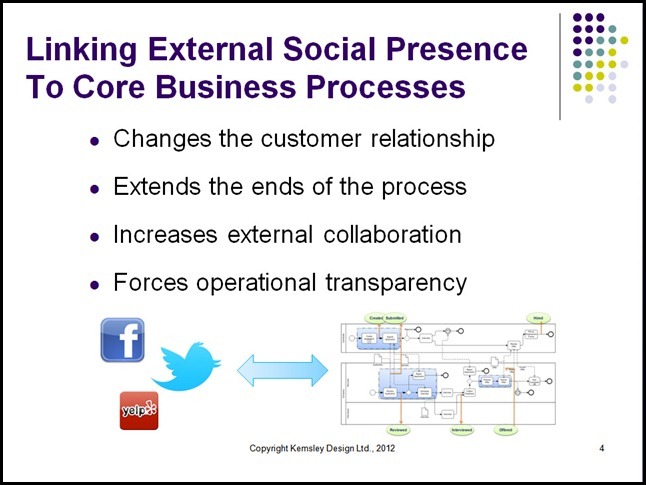 I gave the Monday afternoon keynote at Appian World 2012 last week on the topic of the impact of social technologies on the enterprise, with a particular focus on how social features and exposure are changing our business processes. I’ll post the entire presentation online – I’m thinking of recording a re-creation of my presentation and syncing it with the slides – but I wanted to focus on one slide that I feel is at the heart of what we should be doing with social enterprise. I was discussing how important it is to link an organization’s external social presence with their business processes, and gave two examples from my own experience as a consumer: one good, one not so good. I received word that you experienced a low gas situation with yesterday’s reservation with Civic Champion. Please accept a 2hr driving credit along with my apologies for the inconvenience this caused. All of this happened within 24 hours of the rental, which means that there is some sort of link baked in between their social presence (Zipcar Twitter account) and their internal business processes (complaint handling and customer refund). When I told this story during my keynote, there was an appreciable murmur in the audience: everyone there understood the magnitude of what Zipcar had done to link their external social presence to their internal business processes, and in what must be a fairly efficient manner. With a monopoly on certain concerts in Toronto, I don’t expect RTH to be as customer-focused as a more competitive industry such as rental cars, but I didn’t expect their social media team to be so clueless about their actual revenue-generating business processes and the customer service that supports it. The point of these two stories is not that I love Zipcar and am not quite so fond of Roy Thomson Hall’s exchange policy, but that there is a right way and a wrong way to connect your social media presence to your core business processes. Complaints and requests arriving via social media need to be quickly passed along to customer support teams in the same manner as if they had arrived by email, phone, fax or letter, and handled with the same expediency and professionalism. Technology helps a lot with this – software is available to monitor social media channels for mentions of your company or products, and it’s pretty easy to feed those events into a BPMS or CRM system – but you need to figure out how to triage and filter those events so that your core business processes aren’t swamped by off-topic chatter by anonymous contributors. Social media for business isn’t a game, and it’s not something just for PR or marketing to worry about: it’s a channel of customer engagement. If you do it wrong, it’s not only going to be noticed by your customers, but they’re going to make sure that their followers notice it, too.